As in the past years we will organize special Emerging Test Strategy (ETS2) sessions. These sessions run in parallel with the regular ETS program and have a very high industrial character. Industry experts will introduce emerging technical issues in the broad area of test, which will be discussed with the audience. The format of the sessions is informal, which is reflected in the agenda, in the presentations, and in the timing of the sessions. Most important are the discussions, y/n deep technical, in conjunction with the presentations. We plan to reserve about 50% of the time for discussions, where the presentations are to be seen as introductions to a specific topic. Given the informal character, even the final agenda will only be a guideline. 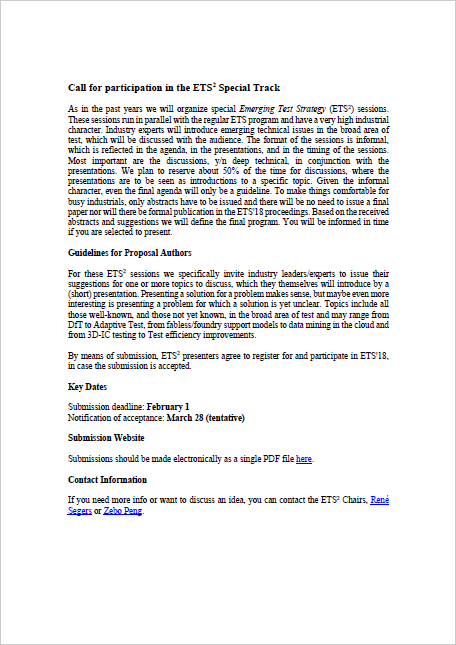 To make things comfortable for busy industrials, only abstracts have to be issued and there will be no need to issue a final paper nor will there be formal publication in the ETS'18 proceedings. Based on the received abstracts and suggestions we will define the final program. You will be informed in time if you are selected to present. For these ETS2 sessions we specifically invite industry leaders/experts to issue their suggestions for one or more topics to discuss, which they themselves will introduce by a (short) presentation. Presenting a solution for a problem makes sense, but maybe even more interesting is presenting a problem for which a solution is yet unclear. Topics include all those well-known, and those not yet known, in the broad area of test and may range from DfT to Adaptive Test, from fabless/foundry support models to data mining in the cloud and from 3D-IC testing to Test efficiency improvements. By means of submission, ETS2 presenters agree to register for and participate in ETS'18, in case the submission is accepted. If you need more info or want to discuss an idea, you can contact the ETS2 Chairs, René Segers or Zebo Peng.